Donley’s is providing concrete services for Choate Construction on the FNB Tower at 501 Fayetteville, the latest addition to the downtown Raleigh skyline. Pennsylvania-based, First National Bank, anchors the 22-story building with a 40,000-SF regional headquarters. 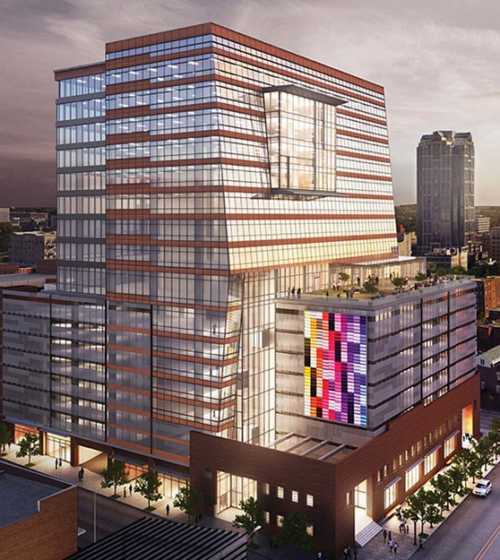 Designed by Raleigh-based JDavis Architects, the massive 420,000-SF tower is built a-top an existing parking deck. Exterior elements include a striking facade with modern low-emissivity glass, metal skin, and vertical mirror glass fins. Luxurious features include six floors of Class-A office space, ground-level retail, 239 luxury residential units with a world-class amenity level, and an outdoor Skydeck terrace offering unparalleled views of the downtown skyline. Our scope of services for the project includes structural concrete totaling 16,600 cubic yards of concrete.